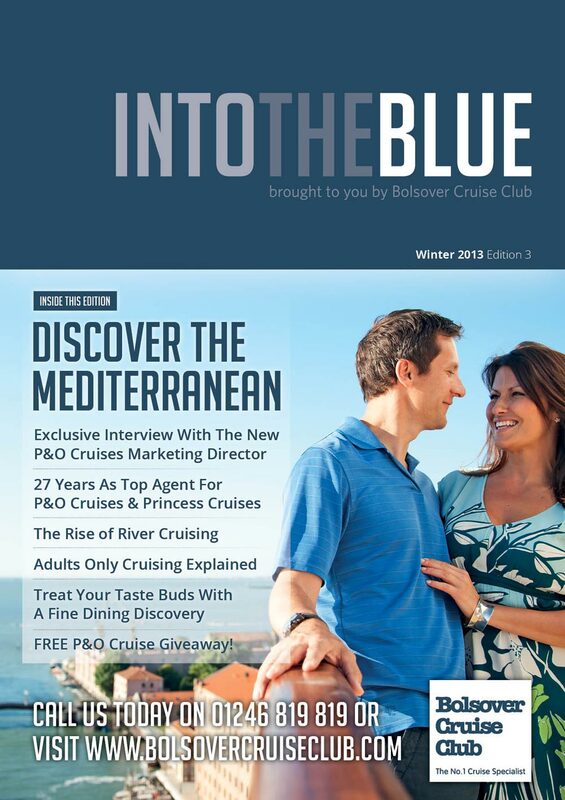 Here you can view all editions of our FREE bi-monthly Into The Blue cruise magazine. Simply click on the edition you would like to read to see the full online version of the magazine. Please note these are older editions of the magazine, therefore sailings and prices will not apply. 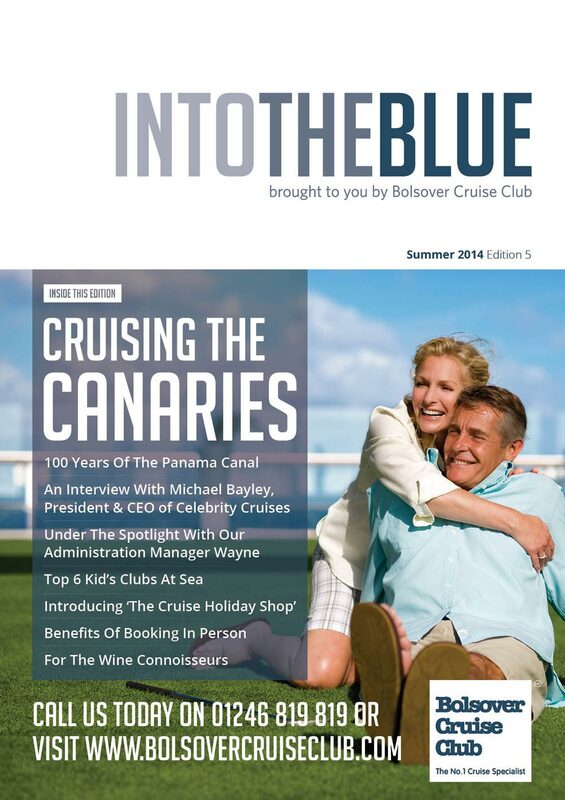 If you would like to receive our FREE cruise magazine. 2018 was a year of big wins for Bolsover Cruise Club and I’m thrilled to say that we have built on our successes and achieved another incredible accolade. Earlier this month, we received the ‘Passenger Favourite’ award at The Wave Awards 2019 for a third consecutive year. What makes this particular award so special is that it is voted for by you, our valued Cruise Club members, and I’d just like to give a big thank you to everyone who voted for us; recognition like this makes everything we do worthwhile. Spring is always an exciting time for cruisers, with the arrival of new ships and the launch of new itineraries. This month saw the launch of Fred. Olsen’s new 2020/21 season and Winter 2020/21 programmes from P&O Cruises and Cunard, including the brand-new P&O Cruises ship, Iona. Some fantastic early booking benefits mean we have seen more people than ever booking their holidays sooner rather than later, something I’d certainly recommend. Don’t delay, secure your perfect trip with the UK’s favourite cruise agent by calling your Cruise Expert today on 01246 819 819. The spring months also see a big development for Bolsover Cruise Club as we launch our own Cruise & Stay service. We can’t wait to help you combine land and sea in one amazing holiday, so stay tuned to find out more! If you’re yet to decide where to holiday next, we have plenty of inspiration for you inside. As experts on sailing from Southampton, we’ve compiled a pick of our favourite no-fly cruises from the UK’s most popular port to destinations around the world. We’re also spending 36 hours in Lisbon, getting a first look at the new MSC Cruises ship, Bellissima, and sharing the reasons why we’re smitten with Scarlet Lady, the first ever Virgin Voyages vessel. I start by wishing you a ‘Happy New Year’ from all of us here at Bolsover Cruise Club and The Cruise Holiday Shop. 2018 was an exciting year indeed for the cruise industry. We saw the arrival of many new ships and the promise of more on the horizon, including Iona; the new P&O Cruises ship is set to launch in 2020 and was met with unprecedented demand when itineraries went on sale in September. We welcomed Symphony of the Seas – the largest cruise ship in the world – and finally had the chance to experience Celebrity Edge. We took to the race track atop Norwegian Bliss, enjoyed a spectacular sailaway out of Venice on Nieuw Statendam and soaked up the sophistication on board Seabourn Ovation. It was a successful year for Bolsover Cruise Club too, as we celebrated winning some of the most coveted awards in the industry, including two British Travel Awards. Thank you to everyone who voted; we work hard to be the UK’s favourite cruise agent and it means the world to have our success recognised, especially in awards voted for by you the public. Last year also saw us induct another handful of our team into the long service club; we now have 45 staff who have worked for Bolsover Cruise Club for more than 10 years and some of those have been helping to plan your holidays for an incredible 20 years! Finally, late 2018 saw the launch of our new website, complete with an updated search function that makes finding your perfect cruise easier than ever. Let us know what you think! Now all that is left for me to say is that I hope you enjoy the first Into The Blue of 2019 and that this is a year of holidays to remember. With awards season well underway, I start with news of some big wins for Bolsover Cruise Club. We were thrilled to receive the accolade of both Best Cruise Travel Agency and Best Online Cruise Agency at the British Cruise Awards. Unlike many industry awards, these are voted for by the public, something which makes our wins even more special. I’d like to extend a huge thank you to everyone who voted for us. We were also very proud to see one of our Cruise Experts, Poppy Outram recognised at the TTG Travel Awards, where she scooped the awards for Cruise Agent of the Year and Top Agent of the Year. Well done Poppy! 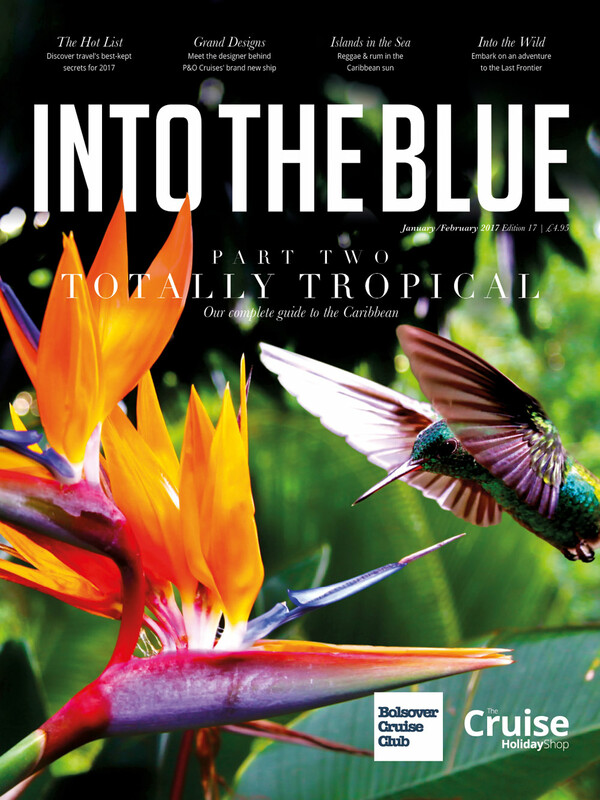 This edition of Into The Blue sees us visit destinations far and wide. We’re sharing four ways to explore Asia in 2019, perfect if you’ve always fancied a little Thai island hopping but aren’t enamoured by thoughts of going it alone, backpack and all. 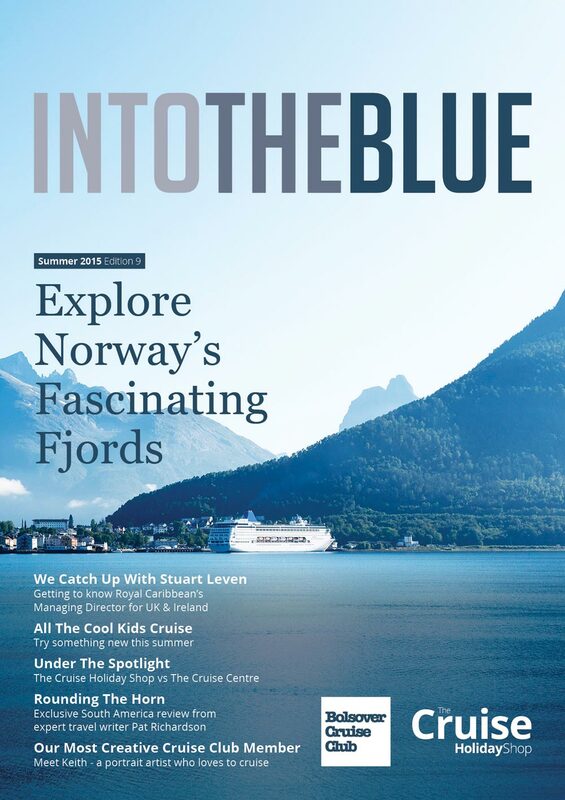 We’re also taking a closer look at Nordfjord, where Iona will sail what is shaping up to be the most popular inaugural season ever for a P&O Cruises ship. We talk adventure with Hurtigruten ambassador Dave Cornthwaite and discover the destinations set to be top of everyone’s wish list for the year ahead. We’re also spending 36 hours in Valletta. The phrase ‘hidden gem’ is often overused but there really is no better way to describe the tiny Maltese capital that has quickly become one of our favourite Mediterranean ports of call. I hope you enjoy reading. And so a summer of heatwaves and World Cup hopes comes to an end, cooler mornings and darker nights taking its place. With autumn comes cosy nights on the sofa, the best of which are spent with the laptop on your knee or brochures in hand looking for your next holiday. Early September saw the ever-anticipated launch of new Summer 2020 Cruise Collections from P&O Cruises and Cunard, each filled with endless opportunities for adventure, rest and relaxation on the high seas. We also discovered that new P&O Cruises ship Iona will sail seven night itineraries in Norway, one of my favourite parts of the world. Turn to page 62 for the inside scoop on how Iona will make that spectacular scenery the star of the show. 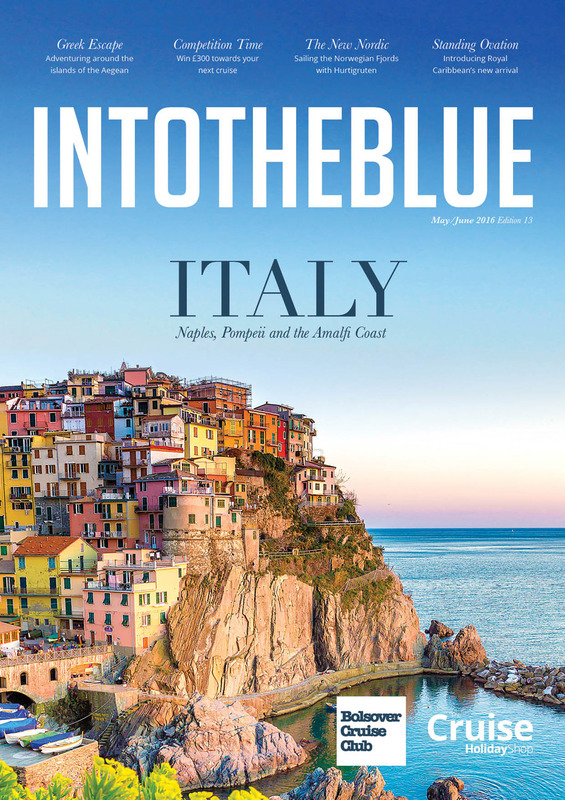 This edition of Into The Blue also brings an exclusive interview with godfather of travel writing, Paul Theroux, plus an article that explores the reality of solo travel. We review the Southampton Harbour Hotel and bring our ‘36 Hours in…’ feature to Hampshire, sharing our tips for your pre-cruise stay. Finally, we’re looking at the winter warmers that’ll bring some much-needed vitamin sea to sun-starved skin once the cold weather hits. Which place in the sun is on your wishlist? I hope you enjoy reading. And they named her Iona! It seems only fair to start with news that P&O Cruises will name their brand new ship Iona. I think the name perfectly represents the beauty of our own home shores. As more details on the ship are revealed, it only makes me even more excited for her launch in 2020. Itineraries go on sale in September so don’t forget to register your interest with us to be the first to find out more about Iona. Stay tuned for the launch of the new P&O Cruises programme soon, too. It has been a busy few months for new cruise ships and we’re giving you the inside scoop on some of them in this edition. I was fortunate enough to sail on Seabourn Ovation and I must say, both the ship and the service on-board blew me away. Norwegian Bliss also left us impressed; could there be a new family favourite in the water? In this issue we’re also exploring some of the smaller Italian isles, talking carbs and the Colosseum in our 36 Hours in Rome feature and discovering whether you really can do Paris in a day. I hope you enjoy reading. Spring is the most exciting time of year for cruisers. New ships arrive and new itineraries are launched, all holding the promise of amazing holidays with our nearest and dearest. Symphony of the Seas – the largest cruise ship in the world - made its debut in spectacular style in Barcelona back in April, closely followed by Seabourn Ovation and Norwegian Bliss. All completely unique in what they bring to the seas, these three ships perfectly sum up what we at Bolsover Cruise Club love so much about cruising; that there really is a ship for everyone, from adrenaline-fuelled fun to pure unadulterated luxury and great adventures. As the UK’s leading independent agent for P&O Cruises, we couldn’t discuss new ships without mentioning the 2020 addition to the fleet. As we go to print, we’re waiting with baited breath for the next big announcement. Anticipation is building and itineraries are expected to go on sale in just a few months, click here to be the first to hear the latest news. 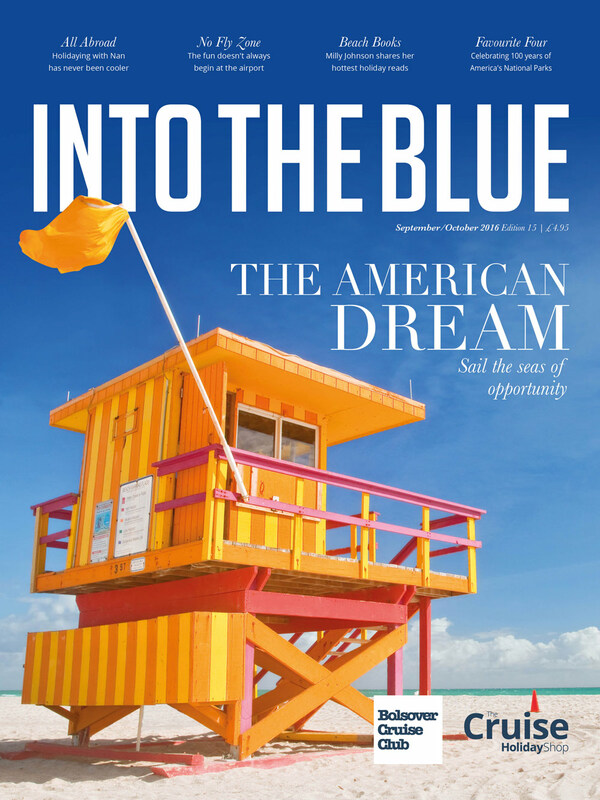 This edition of Into The Blue sees us head for Australia, a destination that has never been more popular with cruisers. We’re also spending 36 hours in Barcelona, whiling away a weekend ‘In Bruges’ and cruising in the fast lane at the Monaco Grand Prix. I hope you enjoy reading. Spring is an exciting time of year for cruising, with new ships just around the corner and the launch of new itineraries putting the world at your fingertips. Back in January, we were honoured to be recognised as the Top UK Agent for P&O Cruises for a 31st consecutive year, so we are incredibly excited for the launch of the cruise line’s Winter 2019/20 programme. Also debuting this month are new itineraries for Cunard’s three iconic Queens. Fantastic early booking benefits and low 5% deposits mean we have seen a huge increase in the number of people booking their holidays early, something I’d certainly recommend if you’re keen to secure your preferred cabin and dining options on your next cruise. Pre-registration is open now for Cunard and P&O Cruises’ new 2019/20 programmes, so speak to one of the team on 01246 819 819 to register your interest before itineraries go on sale next week. If you are still contemplating where your summer 2018 cruise will take you, you’ll find plenty of inspiration inside. From glitzy Monaco and the many islands of the Mediterranean to the Indian Ocean and Norwegian Fjords; wanderlust is guaranteed. We’re also finding out about the designers bringing style to the seas on ships including Celebrity Edge (turn to page 52 for our exclusive interview with Kelly Hoppen MBE), plus we’re celebrating the return of Independence of the Seas to UK shores by catching up with its godmother, Elizabeth Hill. I hope you enjoy reading. On behalf of everyone here at Bolsover Cruise Club and The Cruise Holiday Shop, I’d like to wish our Cruise Club members all the best for the year ahead. 2018 is set to be an exciting year for cruising. Itineraries will go on sale for the latest addition to the P&O Cruises family, an as-yet-unnamed ship that will be the largest ever created for the British market when it launches in 2020. We are counting down the days until we can reveal details of her maiden voyages, so stay tuned! This year will also see the launch of Norwegian Bliss, plus the largest cruise ship ever built, Symphony of the Seas. Later, winter will bring with it the sophisticated Celebrity Edge and technologically ground-breaking MS Roald Amundsen. As is tradition, the first Into The Blue of the year features The Hot List, our pick of the must-visit places for 2018. You’ll also find inspiration for some summer sun in our main destination feature, which focuses on Greece, one of my favourite Mediterranean regions. It’s an edition of contrasts where we’re talking travel with arguably the world’s greatest living explorer, Sir Ranulph Fiennes, as well as showing you a Transatlantic Caribbean cruise through the eyes of 7-year-old William! Wherever cruising takes you in 2018, I hope it is a year of holidays to remember. I start with news of an exciting win for Bolsover Cruise Club in the 2017 Cruise International Awards. Unlike many industry awards these are voted for by the public, something which makes our win in the ‘Best Cruise Agency’ category even more significant. We were also highly commended in the ‘Best Online Cruise Travel Agent’ category and I’d like to extend a huge thank you to everyone who voted for us in the awards. The British Isles are our main destination focus in this edition and we’ve chosen some of our top British Isles itineraries for 2018, all of them offering a new view of our often overlooked home shores. Also featured is our exclusive first-hand experience of sailing the Scottish coast on Her Majesty The Queen’s favourite ship, the Hebridean Princess, plus a diary of Sales Consultant Mandy Maddison’s Transatlantic crossing on Cunard’s Queen Mary 2. Finally, I couldn’t end without mentioning the sad news that Adonia is to leave the P&O Cruises fleet. It is the end of an era for the ship’s loyal following, but we’re thrilled to see that she will return as Azamara Pursuit. If you’re desperately seeking small ship cruising, our feature on the smallest ships at sea promises plenty of inspiration. Even when we are well past school age, there is something about September that feels like the start of a new year. With the kids waved on their way and the heating on, there’s no better feeling than getting comfy on the sofa with a coffee and planning for the months ahead, especially when it comes to holidays. September sees the much-anticipated arrival of the brand new summer 2019 cruise collections from P&O Cruises and Cunard, bringing with them endless possibilities for adventures the whole world over. From family fun to extended escapes, there is something for everyone. If the thought of waiting a while longer for some sun fills you with fear, turn to our Favourite Four feature, where we’re sharing some of the best late deals around for those in desperate need of a little vitamin sea. We’re also looking at four completely different ways to visit the Norwegian Fjords, delving deep into the history of Easter Island’s Maori ‘statues’ and catching up with new Princess Cruises brand ambassador, the one and only Phillip Schofield. Summer saw the arrival of MSC Meraviglia, a ship which has been described as “The Eighth Wonder of the World”. We were fortunate enough to be there for MSC Meraviglia’s star-studded christening and you can read all about the ship of the summer inside. We’re also thinking about – dare I say it – Christmas. Christmas and New Year cruises are incredibly popular and time at sea is the ultimate way to escape those festive family feuds. If you have winter sun on the mind and December feels too far away, our Winter Warmers feature on the Canary Islands is certainly worth a look. Our guide to Venice is a must-read for anyone whose summer cruise calls into the floating city, whilst adventures further afield visit South America and take a closer look at the Galapagos Islands, two real bucket list destinations. Spring is always an exciting time for cruising, bringing with it new ships and new itineraries promising countless maiden calls. In this edition we share our first impressions of Silver Muse following a two-night taster cruise. Celebrity Cruises’ Celebrity Edge reveal a ship unlike anything ever seen before and we have all the details, along with news on the ship’s tempting Caribbean itineraries, inside. 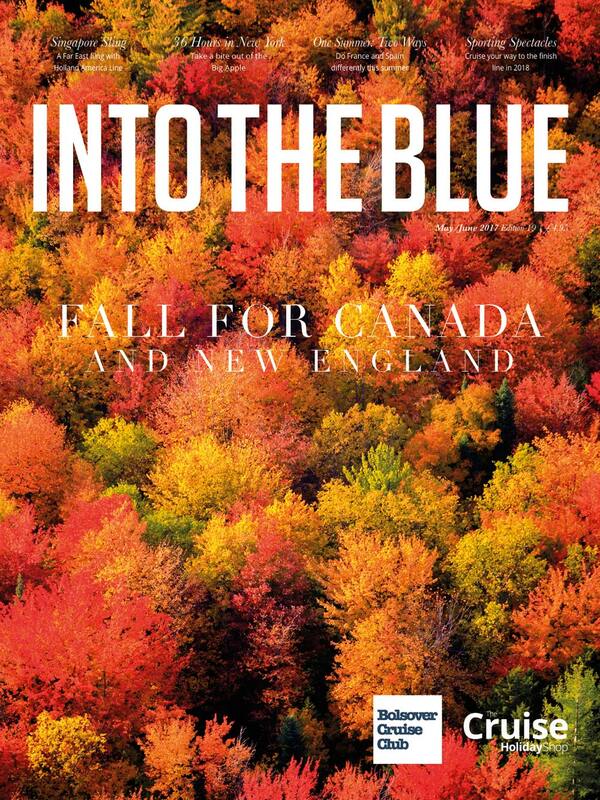 This edition’s destination focus takes us to Canada and New England, a region famed for its fall-foliage and ‘leaf peeping’. We’re also sharing how to start your summer holiday in storybook style in our New Forest feature, taking a bite of the Big Apple in 36 Hours in New York, and looking ahead to the sporting spectacles worth cruising to in 2018. A lot has changed since 1987. Shell suits and baggy trousers have disappeared, though the photographic evidence that they were once quite the style statement refuses to do the same. Mullets are but an unfortunate memory, E.T. made it home, and the distant future portrayed in ‘Back to the Future Part II’ has long since been and gone. 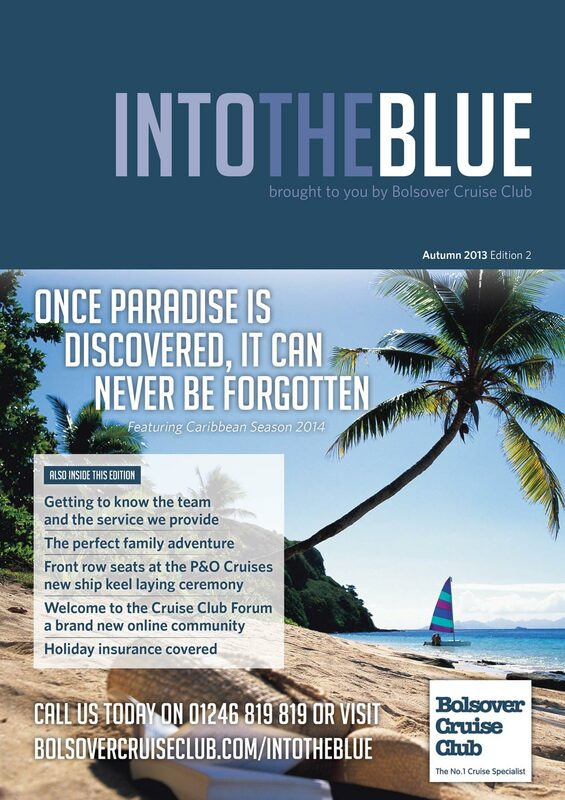 One thing which hasn’t changed in all of those years is Bolsover Cruise Club’s title as the ‘Top Independent UK Agent’ for P&O Cruises. We scooped the accolade for the very first time in 1987, at an awards ceremony no doubt teeming with velvet, shoulder pads and pearls, and have collected the coveted award every single year since. As we returned to the stage in January, minus the shoulder pads, we marked our 30th consecutive year as P&O Cruises’ top UK agent, and I cannot put into words how much of an incredible achievement this is and how proud I am. We decided that there could be no better way to mark the occasion than by taking a look back to where it all began, with someone who has been there almost from the very beginning. Founding partner Derek Wilson has played a fundamental role in Bolsover Cruise Club’s past and present, and I’m sure you’ll find his insights very interesting indeed. 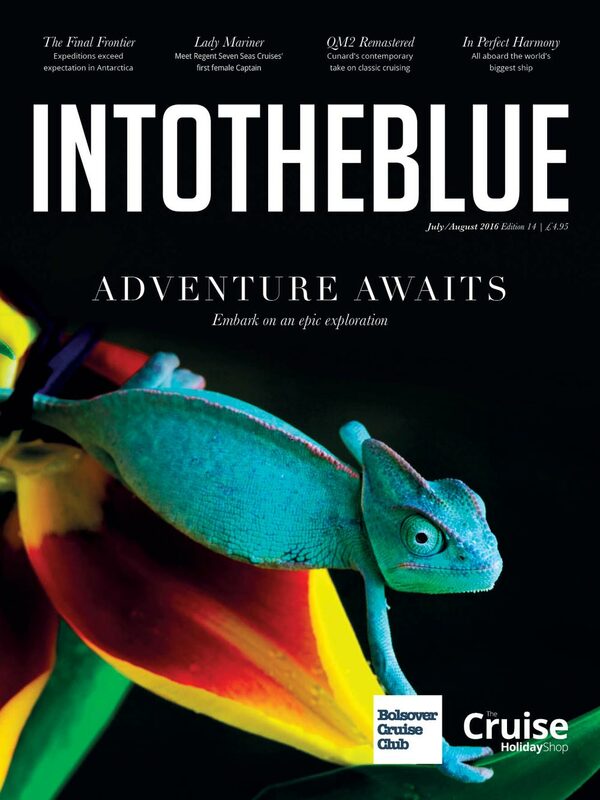 This edition of Into The Blue comes as we wait with baited breath for the exciting launch of brand new 2018/19 itineraries from P&O Cruises, tempting our sense of adventure with maiden calls to new destinations and return visits to some of our favourites. Time spent at sea is precious and choosing where your next itinerary will take you is never easy. I hope our destination features might provide a little inspiration, whetting your appetite for lazy summer days in San Francisco and grand voyages in the Baltic Sea. On behalf of everyone here at Bolsover Cruise Club and The Cruise Holiday Shop, I'd like to wish our Cruise Club Members all the best for the year ahead. We begin 2017 with a brand new website and Cruise Club Forum, both of which I hope you are finding far more user-friendly than previous versions. In addition to a brand new section dedicated to our extensive cruise guides, you will also find the newly-responsive website much simpler to use on mobile phones and tablet devices. The first Into The Blue of the year sees a continuation of our 'Totally Tropical' guide to the Caribbean, one of my favourite winter sun destinations. There is nothing quite like sinking your toes into warm sands – piña colada in hand – knowing that everyone at home is battling wind and rain on the daily commute. There are still some great last minute Caribbean cruise deals to be had for 2017, so give us a call if we have whet your appetite with the thought of a little island time. 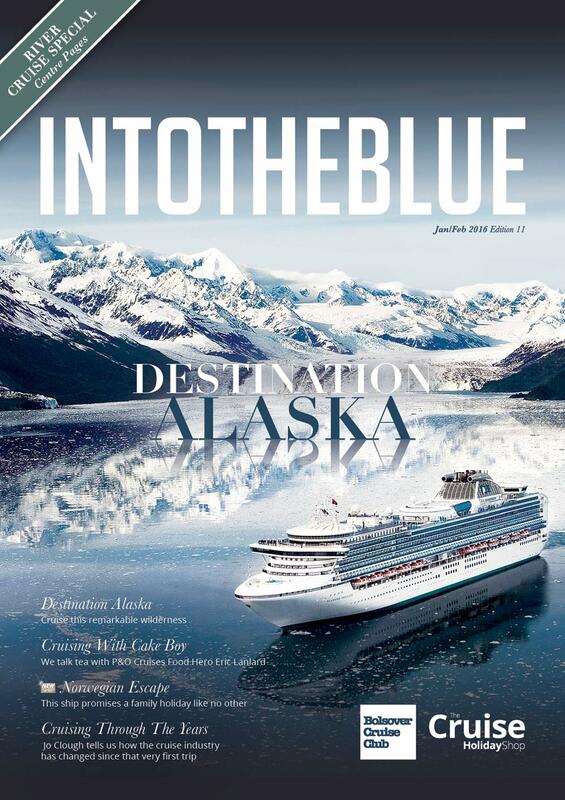 This edition also features a look at the hottest destinations for the year ahead, from a charming rustic village off the French coast, to the vast and awe-inspiring Yukon Territory, a destination often combined with a cruise to the ever-popular Alaska. Wherever cruising takes you in 2017, I hope it is a year of holidays to remember. With the clocks wound back and dark nights firmly on the agenda for the foreseeable future, you could be forgiven for planning an escape to paradise. 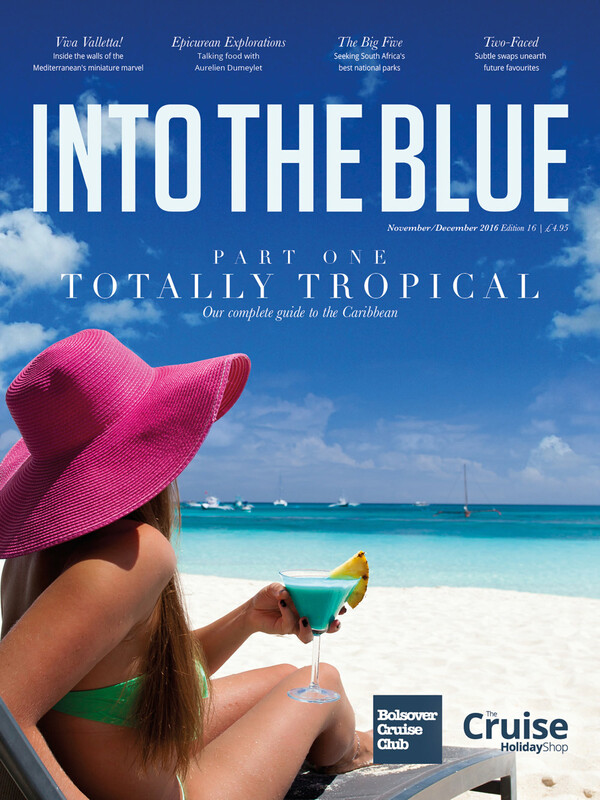 The Caribbean was made for cruising and few other destinations can rival its sun-soaked idylls in terms of popularity, which is why we decided it deserved a complete guide, spread across the next two editions of Into The Blue. With winter having arrived on our own shores, the rain soaking our streets and the skies painted grey, it becomes even more difficult to resist the lure of guaranteed sunshine and stunning beaches, and I hope part one of our guide will help you choose your ideal island escape. 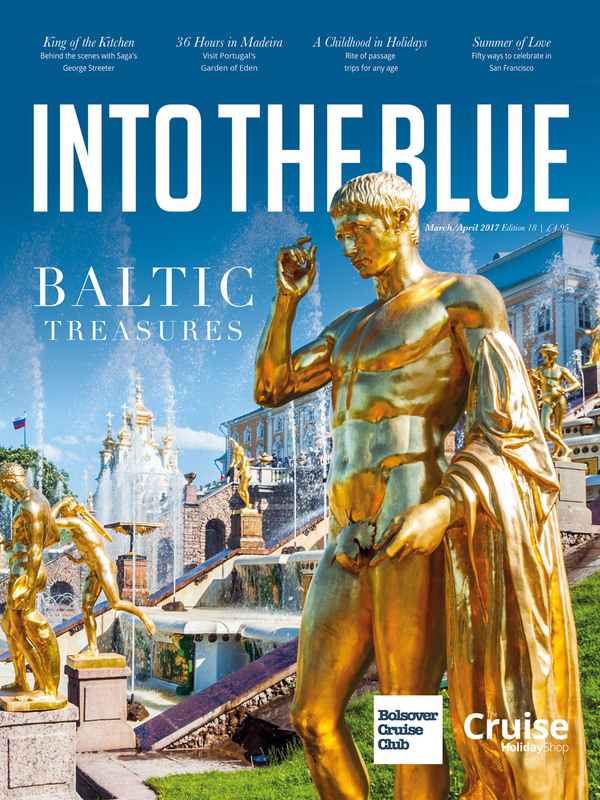 This edition also features one of my favourite places in the world, South Africa, along with a look behind the walls of Valletta; an often overlooked gem of the Mediterranean, and one which will host a number of P&O Cruises fly-cruise itineraries from 2017. We also catch up with seasoned Seabourn adventurer, Robin West, and find out what it takes to dish up dinner on board 'the most luxurious cruise ship ever built, in our interview with Regent Seven Seas Explorer's executive chef, Aurelien Dumeylet. September means many things to many people. For families, it means back to school! The summer holidays are over, new uniforms and pencil cases have been purchased, and the kids are lacing up their shoes for the start of a new year. For those who sail P&O Cruises and Cunard, September marks the beginning of the holiday countdown, with brand new itineraries for summer 2018 finally on sale after weeks of anticipation. For America, September signals the arrival of New England’s famous fall foliage. Many people time their first cruise to the USA to coincide with the season, but the truth is that the destination is perhaps the most varied on earth and is deserving of a visit at any time of year. We’re sharing some of our favourite American ports in this special USA edition, from glamorous Miami and wild Port Everglades, to the charming Southern states and the cityscapes of the East Coast. We’re also taking the opportunity to catch up with Holland America Line’s Koningsdam ad finding out whether Regent Seven Seas Cruises’ brand new Seven Seas Explorer lives up to the hype as the ‘most luxurious cruise ship ever built’, as well as investigating the boom in multi-generational travel and the reality of holidaying when a fear of flying does its best to keep you grounded. I hope you enjoy reading. It is a term which is thrown around often, but what truly makes for the ‘holiday of a lifetime’? Is it cruising deep into the Amazon Rainforest or exploring the Galapagos Islands, or is it sailing the seas of the Mediterranean aboard the largest ship ever built? Perhaps your holiday of a lifetime is crossing the Atlantic on the Queen’s favourite ocean liner or maybe it is joining the tiny handful of travellers fortunate enough to set foot in Antarctica? Whatever it is, cruising can make it happen. Since our last issue, we have seen the arrival of MS Koningsdam and Royal Caribbean’s Harmony of the Seas, both of which are already making waves. Both ships are featured inside, as is an exclusive look at Cunard’s ‘remastered’ Queen Mary 2. Whilst on the subject of debuts, we’re also sharing the best new tourist attractions for 2016, as well as raising a toast to Regent Seven Seas Cruises’ new Captain, Serena Melani. I do hope you enjoy reading. April saw the arrival of Royal Caribbean’s Ovation of the Seas, whetting our appetite for the hugely anticipated debut of Harmony of the Seas – the largest ship in the world. May also sees the arrival of Viking Cruises’ second ocean ship, Viking Sea. We were fortunate enough to spend some time on board Viking Star in March and you can find out how the ship exceeded our high expectations in this issue. This edition’s destination focus is Naples, Pompeii and the beautiful Amalfi Coast; a popular itinerary with many cruise lines and one that explores a part of the world that I am especially fond of. We’re also island hopping around the Greek Isles and joining Hurtigruten on an expedition through the Norwegian Fjords. Spring is a time for new arrivals and in 2016 these come in the form of new ships! From ultra-luxury to action packed, never has the age-old cruising adage of ‘a ship for everyone’ been so true. We’re taking a closer look at all of the year’s new arrivals in this issue and we can’t wait to set foot aboard each of them over the coming months. Spring is also a time when our attentions are turned to planning our summer holidays and we have endless destination inspiration to whet your appetite for the season ahead. We’re exploring Croatia, Copenhagen, discovering the Deep South and cruising Caribbean shores beneath the sails of Star Clippers’ tall ships. 2016 is shaping up to be a rather exciting year with new ship launching from Royal Caribbean International, Holland America Line, Viking Ocean Cruises, Regent Seven Seas Cruises and Seabourn. The last 18 months have also proven especially successful for river cruising so I hope you enjoy our dedicated river cruise feature inside this issue. 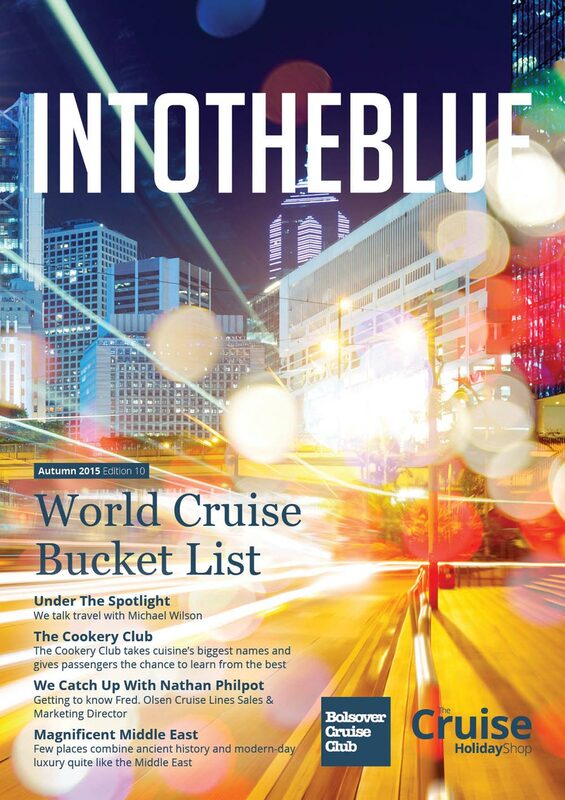 In addition to an interview with P&O Cruises Food Hero, Eric Lanlard, as well as an article from guest contributor Jo Clough looking at how cruising has changed throughout the years, I hope you will find plenty to interest you in our first issue of the new year. Welcome to our biggest edition yet! The autumn 2015 edition focuses on the Middle East and with recent announcements confirming that Celebrity Cruises and MSC Cruises will base ships in Middle Eastern ports, there really has never been a better time to explore the region. We also catch up with Nathan Philpott, Sales and Marketing Director of Fred Olsen. Other content includes Caribbean shore excursions, world cruises and a review of director Julie’s river cruise along the Rhine. And finally, managing director Michael Wilson goes 'under the spotlight'. Our summer 2015 edition looks why family cruising is becoming a popular alternative to the traditional package holiday. We catch up with Royal Caribbean International’s Managing Director Stuart Leven. Our destination focus is the Norwegian Fjords. Home to some of the most magnificent scenery in the world, and a popular alternative to beach holidays. Plus, this year is an exciting one for Bolsover Cruise Club, as we not only celebrate a year of trading at The Cruise Holiday Shop at Meadowhall, but also the tenth anniversary of The Cruise Centre here in Barlborough. 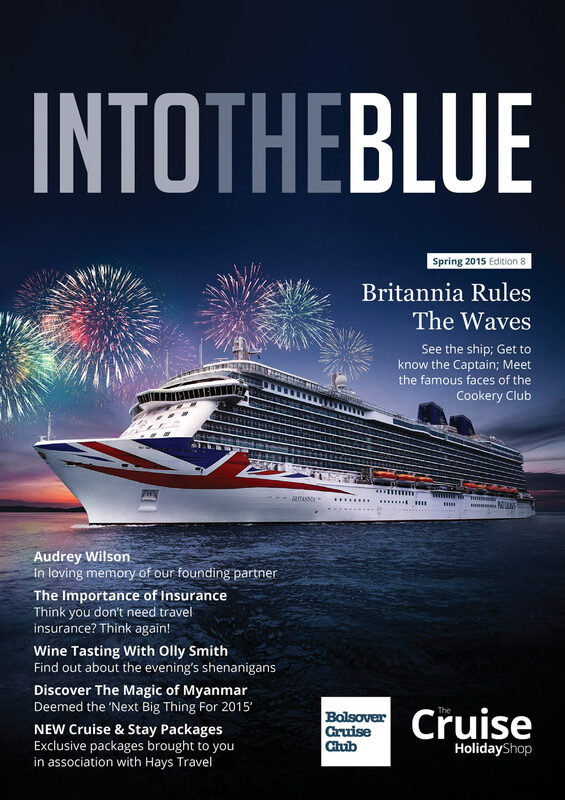 Spring is a time of new beginnings and fresh outlooks, and our spring 2015 edition of Into The Blue celebrates the launch of P&O Cruises’ newest ship Britannia; the most eagerly awaited cruise ship ever developed solely for the British market. Read our exclusive interview with Captain Paul Brown and find out what happened when we invited Food Hero Olly Smith to join us for an evening of wine tasting. Finally, join us as we become some of the very first passengers to board Britannia and witness its inaugural celebrations and regal naming ceremony. 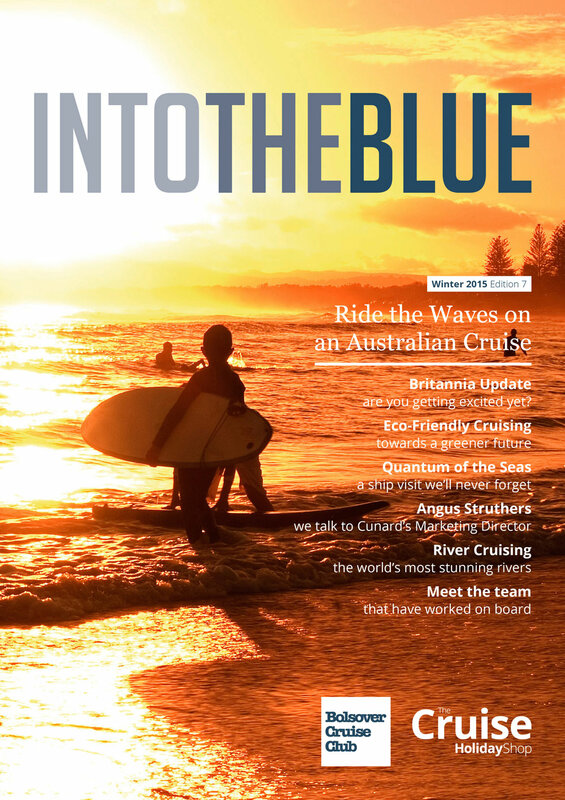 In this edition of Into The Blue you'll find a small update on P&O Cruises' Britannia, a destination focus on Australia, a report on what cruise lines are doing to protect the oceans and our recent visit on Quantum of the seas. We get together with Cunard's Marketing Director, Angus Struthers and we speak to some of the Bolsover Cruise Club staff that have been lucky enough to work on board. We also touch on River Cruising and introduce our new river cruise line AmaWaterways. Enjoy! 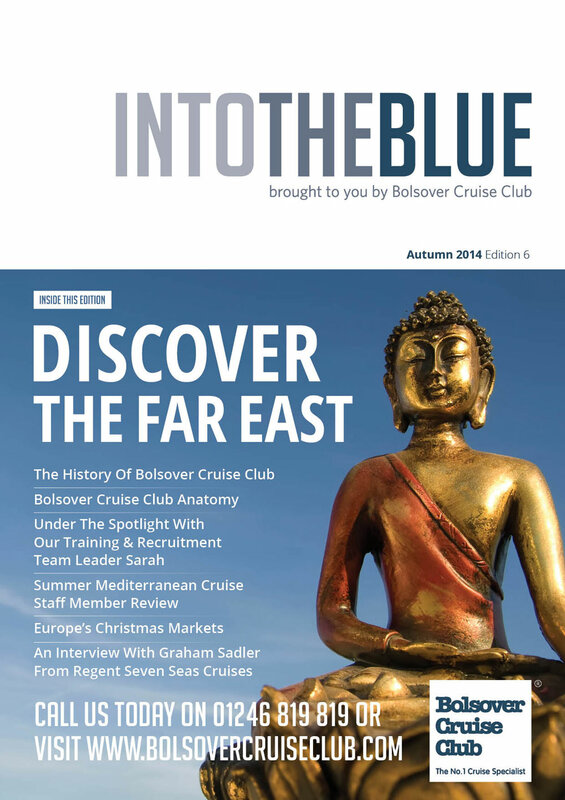 In the Autumn edition of Into The Blue, we share with you 'The History Of Bolsover Cruise Club'. This includes old pictures and details of how we got to where we are today. This is followed up with a company infographic that illustrates who we are today. We also have an interview with Sarah our Training and Recruitment Team Leader and an interview with Graham Sadler from Regent Seven Seas Cruises. Plus a destination guide on the far east and something to get you in the mood for Christmas 2014. In this edition of the magazine you can learn more about ‘The Cruise Holiday Shop’, along with the benefits of booking in person. We also take a closer look at the world of Celebrity Cruises with President and CEO, Michael Bayley. We continue the popular series ‘Under the Spotlight’, this time focusing on our Administration Manager, Wayne Shutt. This edition also offers an insight into the latest cruise news, the top 6 kids clubs at sea, plus we take a look at P&O Cruises’ Strictly Come Dancing sailings. 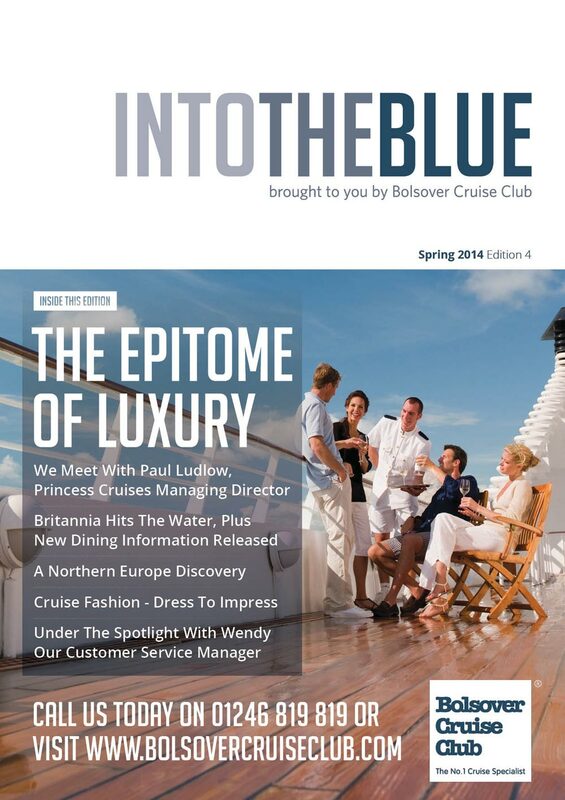 We meet Princess Cruises’ UK Managing Director, Paul Ludlow; feature P&O Cruises’ Britannia; guide you through Northern Europe; unravel the intriguing topic of cruise fashion, and catch up with Wendy, Bolsover Cruise Club's Customer Service Manager. 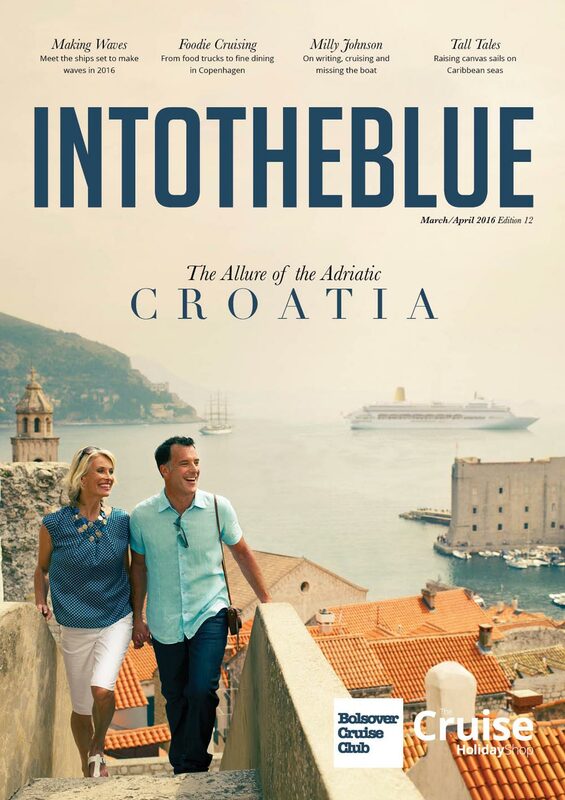 Discover the Mediterranean; treat your taste buds with a fine dining discovery; read about the rise of river cruising; adults only cruises explained an exclusive interview with P&O Cruises Marketing Director, Christopher Edgington and a FREE P&O Cruises giveaway! A behind the scenes look at Bolsover Cruise Club including our One2One service and a 'getting to know us' section. We guide you through the perfect family adventure, a Caribbean destination focus and an interview with Seabourn UK Managing Director, Lynn Narraway. 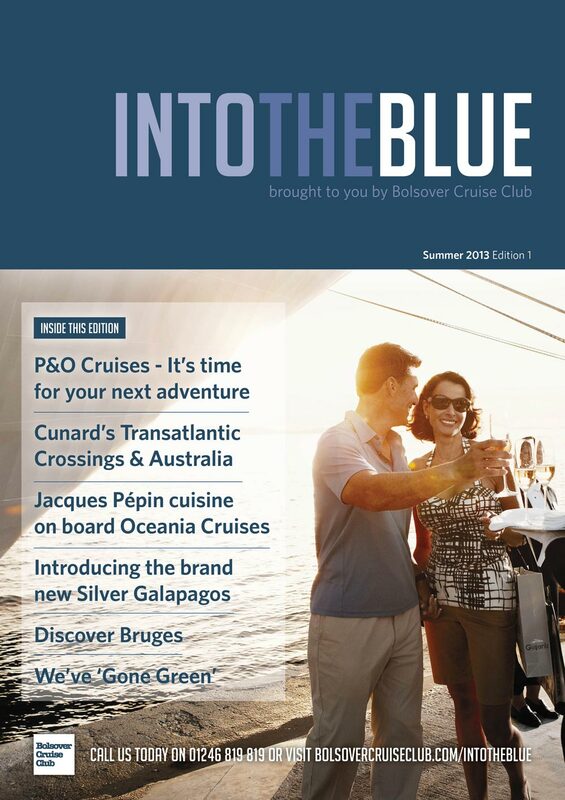 The first edition of Into The Blue, featuring a Bruges destination focus, an account of our experiences at the inaugural celebrations of Princess Cruises' Royal Princess and full details of the Bolsover Cruise Club 'Go Green' choice.